Two lawsuits are questioning the USEF's drugs and medication policies. Photo by Molly Sorge. Two separate parties have filed suit against the U.S. Equestrian Federation over the organization’s drugs and medications rules and policies. Both are alleging that the rules, including the thresholds established for various drugs, are unfair towards competitors. The first lawsuit, filed Nov. 24 in the Supreme Court of New York by trainer Thomas Wright and owners John and Stephanie Ingram, is in response to the USEF suspension and hearing committee process after Fonteyn, trained by Wright, tested positive for 2-(1-hydroxyethyl) promazine sulfoxide (HEPS), a metabolite of acepromazine, at the WEF 6 Equestrian Sport Productions LLC Horse Show (Fla.) Feb. 12-16, 2014. After the subsequent USEF Hearing Committee meeting on May 20, 2015, Wright was fined $2,000 and suspended for two months, which began Jan. 1, 2016. The Ingrams were required to return any prizes and pay $300. In a memorandum filed Dec. 31, the Ingrams and Wright assert that the threshold set by the USEF for acepromazine in competition horses isn’t based on scientifically valid evidence of a pharmacological response. “It’s a concerted effort to bring the attention of the membership that this rule is truly outdated for the time we live in,” said Joel Turner, one of the attorneys representing the Ingrams and Wright. “When the rule was conceived, it was a safe assumption that if you could find it, it had some pharmacological impact on the horse. But now we can find such small amounts. These rulings can interrupt peoples’ lives and unfairly damage a good reputation. We believe the membership deserves more than that. The Ingram and Wright case asserts that the amount of HEPS the USEF laboratory found in Fonteyn’s urine was 5.1 ng/ml, and that no ace was detected in the corresponding blood sample. The second lawsuit, filed Dec. 14 by trainer Archibald Cox and owner Meredith Mateo, is in response to a positive finding for gamma-aminobutyric acid in the horse Cartaire. GABA was found in Cartaire in “excess of normal physiological levels” after routine testing at the Blenheim Summer Classic II Horse Show (Calif.), held Aug. 13-17, 2014. Cox was given a five-month suspension, scheduled to begin Aug. 31 this year, and fined $5,000. Mateo had to return any prizes and pay the competition $300. 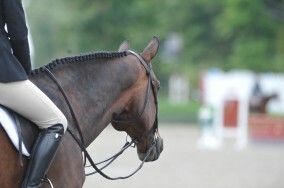 The lawsuit questions the USEF’s findings of the proper threshold for GABA in horses. “We believe we have a strong case and look forward to the court deciding the issues,” said Timothy Pestotnik, attorney for Cox and Mateo. But the USEF is planning on defending both cases in the New York courts. A change to GR410 was proposed by John Ingram, and it will go up for consideration at next week’s USEF Annual Meeting in Lexington, Ky. The proposed change adds language regarding scientific certainty behind the thresholds and can be viewed in its entirety on the USEF website. Read about other recent suspensions.